There is a growing demand for educational professionals to develop a more critical understanding of the key and emerging debates in education so that they can better meet the challenges and demands placed upon them. 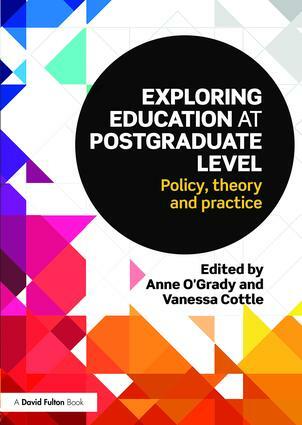 Exploring Education at Postgraduate Level represents a range of perspectives from educational experts to academic researchers, and highlights the key issues surrounding contemporary education. Aimed at supporting students on Masters-level courses, this acessible but critically provocative text is an essential resource for those wishing to develop a more critical understanding of the role, purpose and function of educational systems and practices. 4. The application of psychological principles within education: appliance of science or pick-n-mix? 14. Why bother with masterliness? Anne O’Grady is Principal Lecturer and Partnership Manager for the School of Education at Nottingham Trent University, UK. Vanessa Cottle is Senior Lecturer and Programme Leader for the MA Education at the University of Derby, UK.